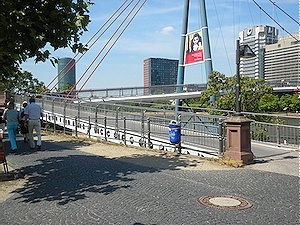 Frankfurt, Germany – Cycle to the airport – First Wave Level – no signs to help you out. Cycling within the terminal building – for staff – Third Wave Level – Pools of bikes scattered around the terminal for their use. Note: Scroll down to end of this article to see our airport rating scale. The last day of this trip has arrived. A short 15 kilometres cycle to the airport and a long plane trip back. Next task was to get a map of Frankfurt and try to understand the route to the airport. In 1995, I tried to find a route and gave up in disgust. So my aunt carried my bike in the trunk of her Mercedes- Benz. First task was to surf the Frankfurt airport web site. Sure enough, the airport web had a page inviting people to cycle to the airport and enjoy the view. Below their breezy welcome, there were instructions to visit the route planner for the State of Hessen. After struggling with the web route planner in entering the data for the start and end points, a route came up with distance information. Since I did not have printer access, I marked the route on my street map. So, on a brilliant weather day for cycling with the sun blazing and a wind to keep the body temperature right, I set off for the airport. The first part of the trip crossing the Main River was pleasant, with bike lanes on streets and bike path on the sidewalk. With my map and route marked, I turned west along the river. From the map, I needed to simply count 3 bridges and after passing a railway bridge, I was to turn left. Somehow, the river and weather mesmerized me. I came upon a bridge and wondered if I had passed the one to turn on. Fortunately, with the help of the map, it turned to be the right one. Shortly thereafter, I was to turn and cycle on an arterial 4-lane street. Why there was no bike path on the sidewalk, mystified me. Maybe it was due to the complete lack of car traffic. 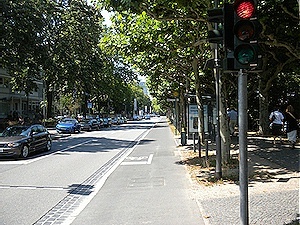 After passing the autobahn overhead, I was to turn off this street onto a path. The question was where. There were no sign posts with directions to the airport or anywhere else. In fact, the only cycling signs to the airport appeared about half of a kilometer from the destination and it really was well hidden. Frankfurt airport train station Jun. 2010. Photo by HJEH Becker. 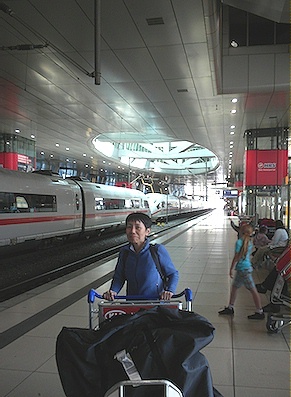 Airport terminal is attached to train station that serves both regional and high-speed trains. Literal translation – “Unter” means under. “Schwein” is pig. Then there is “Steige” were I must get Internet for a translation. Now “Steigen” means to climb. Now is this a place where pigs try to climb out of something? I stood there and wondered if I should turn. Then along came a person out for his daily 20 to 30 km. cycle. It turned out he was 74 years old and has given up touring globally for staying at home. With his help, I made it to the airport. Whether he was going that way or he just adjusted his route to guide me, I never knew. However, I am quite thankful that he was willing to do that. Nothing in the route for the remainder of the trip was obvious or logical. When we parted company all I had to do was to get to the other side of the car parking structure to the terminal. After a couple of attempts, I arrived at a terminal but unsure if it was my destination. Fortunately I had left a couple of hours in case I got lost. Fifteen kilometres and one hour later, I was folding and packing the bike. Ten or fifteen minutes later and a few questions, I was in the right terminal. 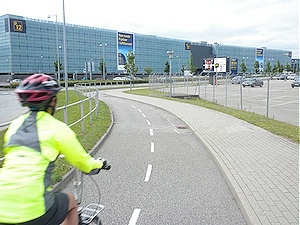 Cycling on bike path on Copenhagen airport property. 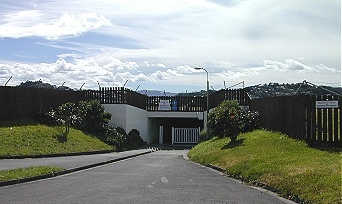 On left is one of the airport terminal buildings. Copenhagen, Denmark Jun. 2010. Photo by HJEH Becker. Only a 10-km., totally stress-free bike ride from downtown to airport on flat terrain. Bike route runs through treed, low-rise residential neighbourhoods by airport. As a side note, I found the people in Sweden, Denmark, and Germany were really helpful for providing directions and advice, at least for those whose navigational capacity was more than a couple of kilometres from where they were. Note: Scroll to end of this article, to see our rating levels for cycling to different airports world-wide. Cycling to the airport in Copenhagen is a real dream. One has choice of routes with cycling infrastructure to choose from. Cycling on the airport property is very pleasant with good quality bike path running the length. . It is only a 10-km. bike ride to the airport on flat terrain. 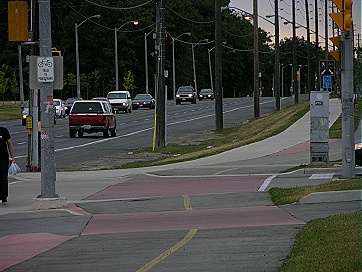 Toronto – Third Wave – Now if only Mississauga would install 2 kms. of bike paths from the airport to Toronto’s Humber Valley bike route system, then this would be a totally ideal cycling experience. Cycling signage to the airport would also be useful. After one finds the Silver Dart Road on airport property and cycles the 2 kms. to the bike path along Eglinton St. which leads into the Humber Ravine and Waterfront cycling path. This path continues along the Don Ravine and into Scarborough. While the whole route is approximately 30 kms. of cycling, it is still ideal day or at night, if you have the right type of bike lights. Just watch out for the wildlife that might cross in front of you. Montreal – Third Wave until you get to 2 kms. from the airport, then maybe half a First Wave to the airport. Come on Montréal, install a 2 kms. bike path from the excellent Lachine Canal route. Canada Line bike-pedestrian 1 km. bridge deck over Fraser River enroute to and from airport. Vancouver, BC Aug. 2009. Photo by HJEH Becker. During bad weather conditions, cyclist can bring bike on Canada Line train directly from airport exit to get downtown-- a 30 min. ride. 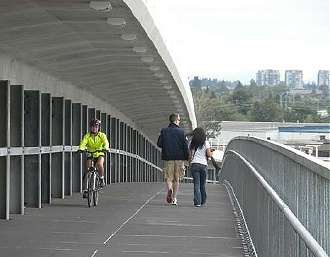 Vancouver – Almost Third Wave with the new bike deck on the Canada Line Bridge over the Fraser River. Depending on the route you choose, a combination of bike routes, bike lanes, and a bike path on the airport property gets you to the terminal. There are sections missing. Leaving the airport, bike lanes get you to the river. Calgary – Third Wave on the airport property and First to Second Wave to get there. There used to be a workbench at the terminal for cyclists to use and where they could store bike boxes while touring the city. Halifax – A nice cycle once you get out of the city. Do not forget your lunch, as it is a piece out. Oh yes, watch out for fog. Why they put this airport into a fog hole is truly amazing. Victoria –Third Wave when majority of the bike route is on the Galloping Goose Trail and the last piece has bike lanes. Also, there is a bike bench at the airport. Edmonton – Not bad, with its wide shoulders on the highway into the city. It is a long way. Paris – Third Wave – with peaceful country roads, bike paths in the country and a 20 kms. 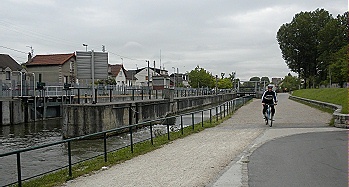 long canal system to get you to the Gare de l’Est train station. It is a 33 kms. cycle with a bakery along the way and is most peaceful. Only the first 250 metres of the cycle at the airport has traffic and it is not much. For instructions, just search the Internet. A cyclist has done a great job of documenting the route. Auckland, New Zealand – Second to Third Wave with bike lanes to the terminal. Signage would help. They have a counter for packing your bike. It has been 9 years now since I made the sojourn to the airport. Wellington, New Zealand – Unrated. I actually never cycled to the terminal but thoroughly enjoyed cycling under the main runways in a very long tunnel. Sure beats cycling around the runways. A bike path on the side of the road will also get you to the terminal. London, England – From low First Wave to almost Third Wave, depending where you are. The City’s route planner for cycling is fantastic even though it took 26 pages to print out the route in fine details. The facilities vary from separated bike paths to on road cycling or dancing with the buses and cars while remembering that like New Zealand, you cycle on the wrong side of the road for the rest of the world, excluding Japan. Third Wave Those who needs physical separation from cars and high visibility of cycling before getting on a bike, especially in intersections. Second Wave The next level of risk-takers and skilled cyclists who would ride a route if some cycling infrastructure were present, such as bike lanes. First Wave Only the real brave, confident, risk-takers, and highly skilled would cycle the route since it lacks adequate cycling infrastructure. State of Hessen Cycling Route Planner. A quick addition to your fine list: the Blagnac airport in Toulouse, France is really easy to cycle to from Toulouse (and presumably anywhere else.) Bike paths much of the way, and easy to find directions on the internet. If anyone likes I could post them here or on my site. Just be careful to get to Blagnac, not to the Air Bus facility, located not too far away! I rode it last September, and it was quite easy. Thanks for this post, it’s so helpful to find this kind of practical info! Happy pedalling! Lisbon Airport is one of the best major Western European gateway airports to cycle to/from city centre and surrounding neighbourhoods (major hub for TAP Portugal, SATA, Euro-Atlantic and a regional base for Easy Jet). Terminal 1 and 2 are only 500m from the city’s bicycle path network along an avenue or a very wide under-used sidewalk, there are two bike-bus routes from early morning until midnight and a subway station at Terminal 1 where bicycles can board for free after 8pm, and anytime on weekends and holidays. The city centre is only 7km / 30 minute bike ride away, and one of the most importante train/subway/bus nodes is only 3km/15 minutes away by bicycle and acessible by segregated cycle path from the Airport. Thank you for your routing suggestion from the Lisbon Airport. Additionally there’s a bike bus CARRIS (yellow buses) #708 which passes close to Terminal 1 and is prepared to carry 4 bikes inside at no extra charge, with service to the city-centre and to the 1998 Expo site (Pq. Nações) every 15 minutes from 6 am to midnight.